Crochet in a spiral. Use something to mark the first stitch of a round and move it up as you work. ''The Magic Circle'' is use to start each piece. Alternative technique: ch 2, then sc x6 into the second chain away from the hook. Slip stitch to join the round. This creates Round 1. *fasten off and leave a 12'' tail for sawing. *sl st and leave 12'' tail for sewing. 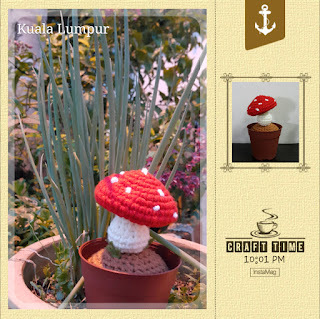 **stuff MUSHROOM's body with Poly-Fil and sew onto the MUSHROOM's head. *sl st and stuff the body with Poly-Fil. Position and sew Mushroom onto the SOIL's body.